This blog was written by Livia Mazur, a Mapping Specialist at National Geographic’s Center for Geo-Education. Have you ever seen a map and marveled over all of the information that it contains? It is incredible how maps can capture so much of the real world and depict so many places. From big cities to small towns, maps use characteristics such as topography, hydrography, industry, and recreation to tell the story of a place. This map comes from the U.S. Atlas for Young Explorers, a great complimentary resource for teachers using the U.S. state tabletop maps. It is available for purchase by clicking the map. Map by National Geographic. Amazing as information-rich maps are, sometimes students are in need of something more simple. Sometimes a map with less is one that teaches more. Our NEW U.S. State Tabletop MapMaker Kits maps focus on mapping basics and include state boundaries, interstate highways, rivers, and the top ten most populous cities. Additional map details that might make a map too overwhelming for younger audiences, such as too many place-name labels, have been peeled off the map. If you work with older students and are missing these additional features, have your students add information to the map themselves for a more hands-on learning experience. Our NEW State Level MapMaker Kits enable educators to print out a map like the one pictured above of states. They’re roughly the same size as a tabletop—35” by 44” large, available as a tiled map that prints out on 10-16 sheets of regular sized (8.5” by 11”) computer paper (the number of sheets varies per state). They are great for easy assembly and convenient printing. Map courtesy National Geographic. Assemble the map yourself, or have your students assemble it. Putting a map together can be a fun group activity. Students trim the map sheets and figure out the puzzle of how the map goes together! Check out this helpful video to learn how to download, print, and assemble these awesome maps for your classroom. Start with a “blank” map. Engage your students as mapmakers, and have them add drawings and symbols to the map themselves! Have students complete a mental mapping exercise by asking them to map personal experiences within their home state. If your state played a role in the Underground Railroad, teach a history lesson about key players and places. Have students add a point on the map, along with notes, for each person and place you discuss. At the end of the lesson, have students review the notes they took on the map—did events happen in certain types of places? Are there noticeable patterns and connections? Examine the connected relationship between cities and agricultural areas. Show the largest cities on your state’s map. If school’s location is not listed, have students add a point to the map. Then, ask students where they think the food in their supermarkets comes from. Discuss any agricultural areas in your state, and talk about what crops are grown there. Have your students draw key state crops on the map to indicate these agricultural areas. Ask: How does the food grown in agricultural areas get to our supermarkets? To people living in big cities? Have students add these transportation systems to their maps. Abstract ideas can take a more concrete shape when notes are taken right on the map. Teach younger students map reading skills. Along the edges of these maps there are letters and numbers that make up an alphanumeric grid. This is great for younger learners who are not yet ready to learn about the global grid system that uses latitude and longitude. For example, if you are using the New Hampshire map, you can ask your students, “Who can tell me the elevation of Mt. Washington? Hint: the answer is in D4.” Tell students to place one finger on the D at the side of the map and another finger on the 4 on the top of the map. Have them trace both fingers straight across from the D and down from the 4 to help them find their answer. This “trick” can be a handy thing to help you to draw your students’ attention to a particular place on the map. It can also be a useful practice for your students to learn, since this is a typical way in an atlas index to find where (in the atlas) a place is located. Have older students measure approximate distances between cities using the scale bar on the map. A scale bar relates distance on the map to distance in the real world. The example scale bar above from one of the maps, shows that the full length of the bar is equivalent to 100 miles in the real world. Have your students measure the scale bar with a ruler and then use the ruler to measure between features on the map to determine distance. This is a great way to illustrate to kids how maps can shrink the big wide world to something small enough that we can see! Incorporate some fun math problems. Ask something like: “How long do you think it would take to drive from Duluth to Minneapolis if the speed limit is 50 miles per hour?” Your students can use the map, the scale bar, and ruler (as well as some arithmetic skills!) to figure out this answer. Have them compare it to driving directions from Google Maps and see how close they were! Decode the map. 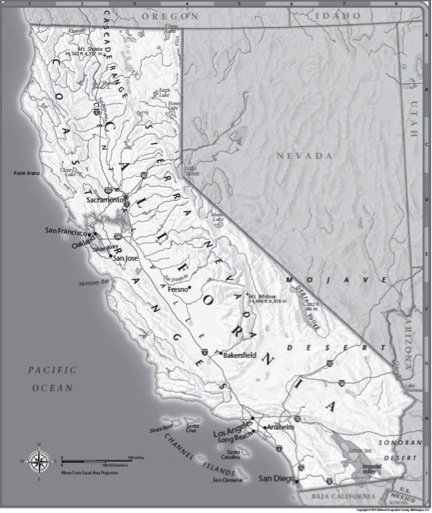 In addition to the map itself, you can download and print each state map’s legend. Each line, dot, and symbol on the map means something specific. Ask students what they think each symbol means, and have them check their ideas against the legend. For example, if someone were looking at the Hawaii map, students should decode the dotted pattern to be lava. 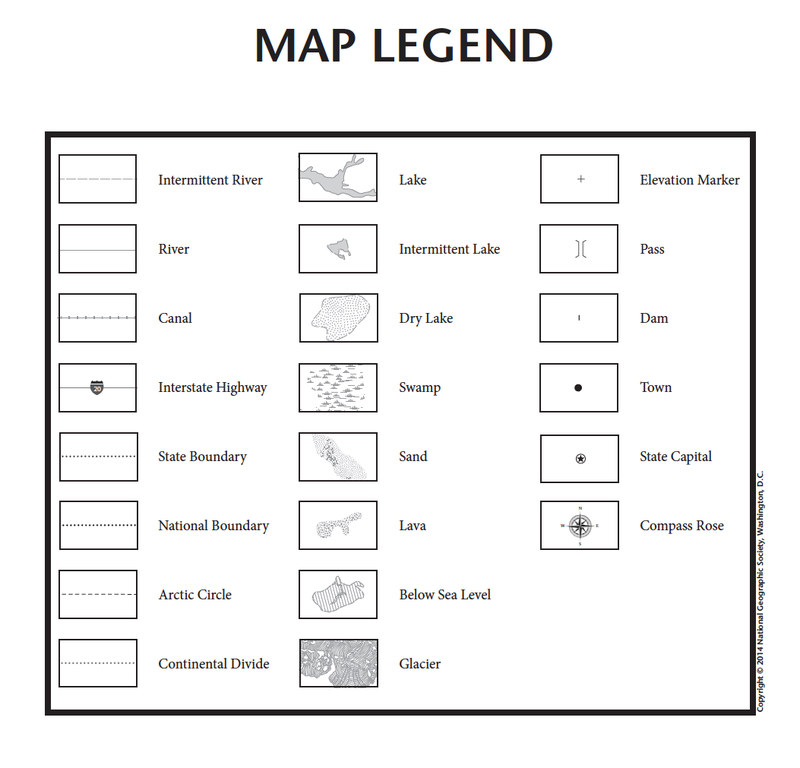 Have students create their own legends by adding features to the map as symbols, and adding those symbols to the legend. Explore a different state. Do you have your students do state projects, where each student is assigned a different state to research and report on? These maps are the perfect learning tool for that project! For a fun spin, have students pick out which state they’d most like to learn about and provide them with a state-level tabletop map with their pick to kick the project off. Instead of writing a traditional paper, have them hand in their report as a filled-in map. Be creative and have fun! Take any current lesson plans you have that incorporate maps and see if these tabletop maps might be fun way to mix it up a bit! Before jumping in, download your state map from the State MapMaker Kits collection. You have the option to print a tiled map, which is a large map that prints out on 10-16 sheets of computer paper (the specific number of sheets depends on the state) for easy assembly and convenient printing, or as a “poster version” that you can print on a single sheet of paper using a large-format printer. More specific printing instructions are available on your state’s tabletop page. For more ideas on how to incorporate mapping activities into your classroom, visit our Mapping page. Hi. I think we (parents) should start teaching our kids about the world map very early, even before they go to school. Exploring “attractive”, coloured maps, playing with map puzzles etc. can be really fun for them. There are a lot of map games on the internet, my daughter started to play such games when she was 4 years old. Now she is 8 years old and she knows almost all countries, flags and capitals. I found for her a little more “advanced” website with map game: http://eduworldmap.com. There are even tests for particular countries and a lot of options that make learning very effective. There are even tests for NBA or NHL teams! Learning the world map this way can be really fun and effective. Next Next post: Why Is This Year Different From All Other Years?